Universal AVM Cargo/Trunk mats for your vehicle's trunk or cargo area, feature a Trim-to-Fit design that allows for a truly custom fit and includes specially engineered reservoirs and ridges built to trap and keep fluids away from your vehicle's interior. Universal Protection, WeatherTech AVM Cargo Mats protect your investment from normal wear and tear. Intelligent design, combined with trim lines allow for a truly custom fit. An outer ridge and reservoir contain and keep fluid away from the vehicle’s interior. Made from a soft, flexible rubber compound that will not curl, crack or harden even in sub-zero temperatures. Textured finish and raised areas help prevent cargo from shifting. Perfect for hauling just about anything from gardening supplies to construction materials, even the family pet. These features, combined with our commitment to the environment and sustainable design, led to the development of our advanced rubber-like Thermoplastic Elastomer (TPE) compound that is an OEM approved, virtually odorless latex-free material, that contains no harmful PVCs, cadmium, or lead and is 100% recyclable! Available in Black, Tan or Grey. The WeatherTech AVM Cargo Mat is a universal trim to fit application. Please verify that these dimensions will suit your needs and fit in your 1971 Pontiac Grandville to your satisfaction prior to purchase or trimming. I have ordered two sets of weathertech floor mats (the laser fit) for two truck we have had in the past...both sets worked great and have lasted! I am ordering another set for my sons car and have no doubt that this set will be the same. Great product...worth every dime! Very impressed with the fit and quality of these mats. I bought the whole shebang, floorliners for every row and cargo mat. I have 2 large dogs, a German Shepard at 118 lbs and a Siberian Husky at 80 lbs. I have had them on the mats and their nails do nothing to them. Very high quality. I would highly recommend these floorliners and cargo mat to anyone wanting to protect their investments. And these days at the price of these new vehicles, they really are a substantial investment. I had been procrastinating on purchasing the cargo liner. My husband purchased it for me for Christmas, I LOVE IT!!!! It completely covers all of the carpet in the cargo area of my SUV. Things dont slide around back there like they did before getting this floor liner. Also, I dont have to worry about putting something dirty in my car and messing up my carpet now. Every vehicle that I own from now on will have one of these!! 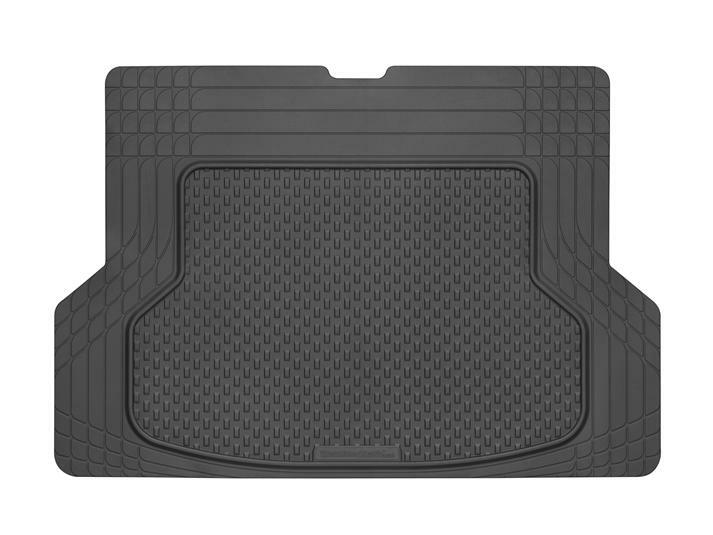 Husband was wanting these WeatherTech Mats for his New Ridgeline. So I ordered them for Christmas. He loves them! They fit perfect and they look so good! Best gift I could have bought for him. I have bought many items and they are great and standup to everyday use keeps looking great! The same cargo liner has served me since 2003. First, in two different Civic Hybrids, then in several Prius Hybrids and now, after 12 years, with a little trimming, it is serving in my 2015 Volt. What a terrific product. We have a 105 lb Golden retriver who Rides in the back, He is a bit neourotic and paces constantly, but the WeatherTech Universal Cargo Mat has surviced a two hour road trip with him. It has also stood up to 20 cement blocks that were placed in the back of the vehicle during a yard project. I can't wait to see what else it will hold up too. It's easy to clean - just hose it off and it's good to go again. I bought the Cargo Mat first for my 1988 Ford Crown Vic and liked it so much that I bought one for my brother's 1988 Mercury Grand Marquis for Christmas. It fits well enough without cutting and does a great job protecting the trunk lining. What can one use to trim the mat? A standard pair of scissors is all that is needed to cut the mat. What happens if I trim this and mess up, can I return the mat? Remember the old carpenter adage – measure twice, cut once! Once the item is modified, it cannot be returned. Please refer to our Lifetime Limited Warranty page for additional information. What is the height of the inner lip? The height of the inner lip in the mat is .25 inches.